The long legged doji of Tuesday duly delivered yesterday for the usd to cad pair, ending the session with an up candle, but one that failed to inspire or provide a huge degree of confidence! 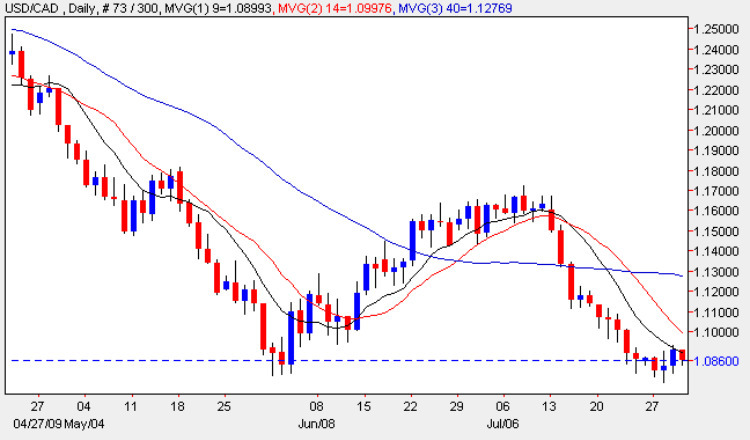 Whilst this could be the start of a short term reversal as we saw in early June, yesterdays narrow spread candle was weak, with the high of the day failing to clear the 9 day moving average which seemed to act as a barrier to any further progress higher. In addition we have the minor resistance level now ahead at 1.10, and for any longer term reversal higher we need to see this level breached before we can assume that this move has any momentum. Should prices once again fail to clear the 9 day and 14 day moving averages, and in addition find this resistance level too strong to penetrate, then we can assume that this is only a minor move, with the prospect of a further fall to come in due course. The main fundamental news on the economic calendar today are the Unemployment Numbers in the US, and for Canada it’s the RMPI and IPPI data. The first of these is the Raw Materials Price Index, a leading indicator which measures the change in the price of raw materials, and is generally considered a leading indicator of inflation (or deflation). The forecast for today is 3.1% against a previous of 2.2%, whilst for IPPI ( which is just for goods produced domestically) the forecast is 0.2% against a previous of -1.1%.